Last week I read and reviewed Miss Timmins' School for Girls, a delightful coming-of-age novel set in 1970s India. It's unusual and unique and incredibly compelling and I can't rave about it enough. I'm excited to share my interview with the author, Nayana Currimbhoy, as well as another chance to win a copy of her book. My very first piece of fiction was a short story, when I was nine, and for some reason I still remember how good I felt when I wrote it, and how great it felt when it was read aloud in class by the teacher. It was something about a jewel hidden in an umbrella. That was when I decided to write a novel. It has only taken me more than forty years to get to it! I write at night, mainly, when the family is asleep, and in short, intense bursts when I am in my country cabin in the summer…the thing I really need is to have a stretch of time where I have the comfort of letting my mind play. 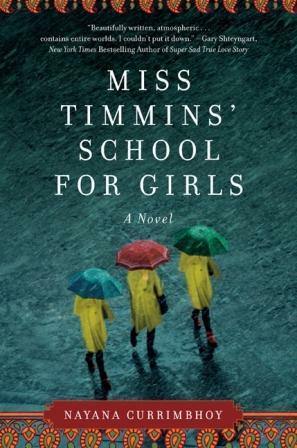 Was Miss Timmins' School for Girls the original title of your book? I still marvel at how the title dropped. It took me five years to write the novel. Throughout, there was not a single title that stuck. I had a file on my laptop, called titles. None of them worked for more than a few months. Drove friends and family crazy whining for title ideas. Even with my agent, Dorian Karchmar of William Morris, we went back and forth until the VERY morning she was sending it out to sell. Suddenly I get a phone call from her “two other agents from William Morris, came up to me after the meeting where the book was discussed,” she said, very excited, ‘they suggested we call it Miss Timmins’ School for Girls’ “. We both knew that was the true title, and so it is! To answer your question, the title came at the very last minute, from someone I have not even met. As you were writing Miss Timmins’ School for Girls, was there a particular scene or character that surprised you? That is a good question. A lot of scenes went in ways I did not expect, and many characters meant to be small became huge as the story went on. But the character that surprised me was Nandita, my schoolgirl narrator. I used the device of a schoolgirl narrator for three reasons: I wanted to a counterpoint to Charu, to let the reader see her from another point of view, I wanted to get into the daily lives and rituals of boarding school life, and I wanted to provide some comedy. I thought of the school girls initially as my Greek Chorus, my commentators. But Nandita became more and more dynamic as she moved through the story, and eventually took matters into her own hands, with heartbreaking results. I spent so many years of my life NOT writing fiction, that right now, its my most favorite thing to do, my main hobby. Right now, I am in my little cabin in the mountains in upstate New York, spending time with my family, taking long walks and cooking huge meals. That is a combination of my favorite things to do. So many great books, so little time! I love books that give you a window into another world. I am reading Huckleberry Finn right now, and it is proving to be most excellent. Recently read Moth Smoke by Mohsin Hamid which I loved, it is set in Pakistan and shows one young man falling apart in a spectacular fashion. My thanks to Ms Currimbhoy for her time! You can find her on Facebook and Twitter. Giveaway! I'm thrilled to offer a copy of Miss Timmins' School for Girls to one lucky reader! To enter, just leave a comment with an email address. Open to US/CA readers, ends 7/29. For another entry, be sure to comment on my review! I like hoe the title came about. Thanks for the giveaway! One book which would have been nice to be open to all!!! have tried to locate this book here and failed! sounds so very good. I love that the title came from some she's never met and that she's currently reading Huckleberry Finn -- that's one of my favorites from childhood. GASP! Thanks for the second chance at winning the book. I always love your interviews. @Mystica: Hopefully it will be released overseas soon -- it is really such a good book. I'd really love to read this book. Thanks for the opportunity.